One amazing taco packed with flavour! 1. In a medium bowl, stir together the flour, baking powder, and salt. 2. Stir in buttermilk and mix until the dough comes together. Add more flour if necessary to be able to handle the dough. Do not over knead. 3. On a floured surface, knead the dough until smooth. Less is more. 4. Heat canola oil in a large, deep, heavy skillet on medium to high heat. Oil should be about ¾-inch deep. 5. Break off ¾ cup sized pieces of dough, and shape into round discs ¼-inch in thickness, making a thinner depressed area in the center. 6. Fry breads in the hot oil until golden on both sides, turning only once. Drain on paper towels. 1. In a large skillet, over medium-high heat, brown the ground beef with butter. Once the ground beef is browned, drain any excess liquid. 2. Add kidney beans, stewed tomatoes and taco seasoning. Bring to a boil and let simmer for 45 minutes to allow flavors to blend. 3. 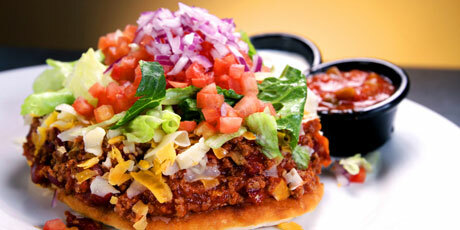 Once finished scoop meat onto fry bread and top with desired taco toppings (lettuce, tomatoes, sour cream etc).